When I quit my day job in early July it was as traumatic as a birth. As I walked down the back “employees only” hallway the last time as an official staffer, I cried like a baby while trying rather unsuccessfully to hide my face behind a vase-full of sunflowers. It was a pretty pathetic scene, but at least I was fully clothed for this “rebirth” as a creative independent. Once outside my workplace, I put on my shades and took my first breath of air as a free woman. I was immediately overwhelmed by all the possibility and creative opportunities that I now had time to pursue while being a more attentive mother to my 3- and 5-year-old daughters. One glance at my beautiful family waiting for me in the parking lot that day and I knew this next phase was going to be awesome. Nearly two months later I’m happy to report that I’m having a blast and ready to announce my latest creative venture: I’m making oak potholder looms. 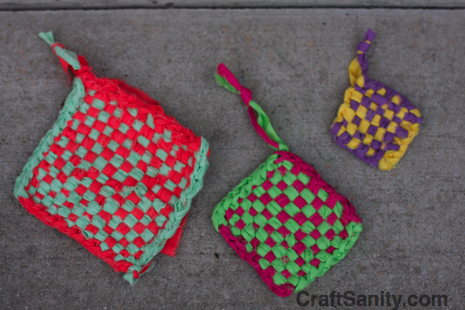 Remember those looms we used to make looper potholders? Yeah, well, I never outgrew my loom and that’s what I’m making… in every size imaginable. Surprised? Yeah, well that makes two of us. This was not part of my long-term plan. I mean, I’ve always loved weaving and have fashioned quite a few looms out of cardboard and scrap wood, but I never imagined I would be loading up on non-toxic wood glue, sand paper and spending hours pounding pegs into oak frames. I decided to start making looms last month after I did a TV craft segment about making potholders out of recycled T-shirts. 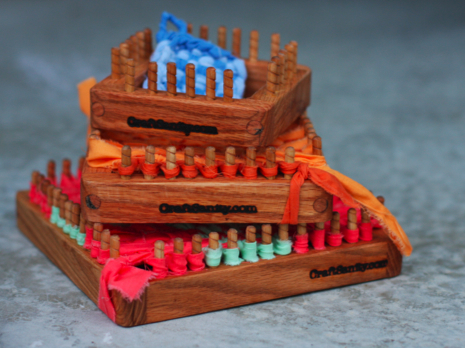 I was getting a lot of requests for wooden looms like the one I used in the segment and I couldn’t find a place to buy more in all the sizes I wanted. After deciding not to invest in a bunch of expensive tools to do it all myself, I contacted a local wood worker who agreed to make loom frames for me in all the sizes I requested. From there I take the frames home and glue in all the pegs and sand them down before rubbing on the oil finish. 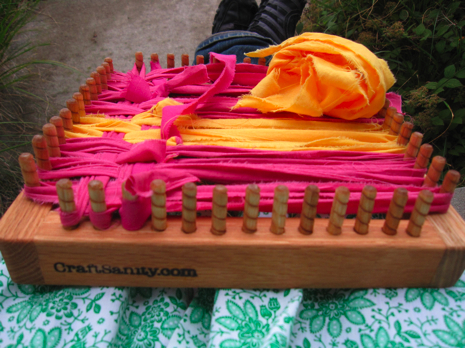 So basically the last month has been a whirlwind of loom-making and branding with my new “CraftSanity.com” brand. I’ve ordered boxes for shipping and fumbled through the Etsy store setup and junked up the dining room in a most historic way. I’ve been selling the looms at the local art market for the last couple weeks and teaching people to weave on them with recycled fabric. (Thanks to all of you have purchased looms and humored me when I’ve insisted that we set it up to weave before you leave the booth.) Reminding people how to weave on these looms has been a wonderful experience. Saturday at the farmer’s market I met a little girl named Sam who made my day. She was so excited about the looms that she was giddy. Watching her weave was like stepping back in time. I was that excited about weaving when I was a kid. Heck, I’m still giddy about it and love to introduce the skill to others. If you want to check out the first loom size I’m offering online, please check out my Etsy shop. I’m starting with the potholder size loom and will be adding coaster and mini-Christmas ornament sizes in the coming days. 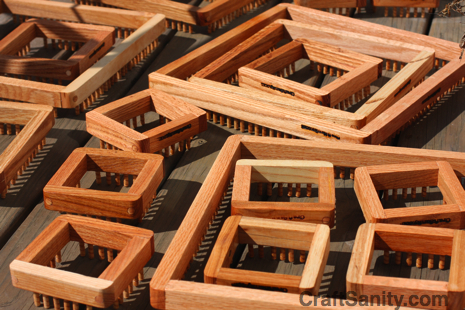 Even if you’re not a fan of potholder looms and think I’m a little nuts for starting up a wooden loom business, I hope this post inspires you to try out that crazy idea you’ve had bouncing around in your head for a while. It’s fun to go where the wind blows you every now and then. Maybe it’s time to DO that thing you’ve been wanting to do for years. An old boss walked by when I was selling looms on Saturday and the look he gave me could have been interpreted as though he thought it was amusing that my station in life has changed from professional journalist with a steady income to crazy freelance-writing, craft girl hawking wooden looms at a farmer’s market. But I couldn’t help but smile big at him because I’m so much happier than I ever was working for The Man. This is exactly what I’m supposed to be doing right now and I’ve never felt more certain.